Somehow I’ve been invited to a product launch secret party, I’ve no idea what it’s for just that it’s “a new device designed to keep you in social sync more than ever before”. The only other snippet of info is a site which reveals a bit more of a hidden image with every code entered in by invited folk. I don’t know what the URL Dried On Paper means either. 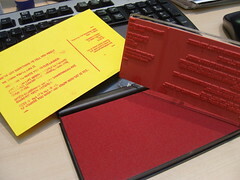 The invite is pretty snazzy too, a little red ink pad and stamp with the invite on. I did manage to cover myself in red ink while playing it though. Messy Helen. Anyone got any more info?